The Rural Action Energy Committee is helping to host a free showing of the insightful new documentary "Coal Country" to help raise awareness of the film and the challenges faced in modern coal mining communities. The screening will take place next Friday, November 13th, 7:00 PM at the OU Baker Center Theater (second floor). Several groups, including the Sierra Student Coalition, the Appalachian Sierra Club Group, OU Office of Sustainability and Rural Action Energy Committee have been organizing to bring this important film to our area. “Coal Country” is a dramatic look at modern coal mining. We get to know working miners along with activists battling coal companies in Appalachia. We hear from miners and coal company officials, concerned about jobs and the economy, who believe they are acting responsibly in bringing power to the American people and those who decry certain modern mining practices as criminal. Both sides in this conflict claim that history is on their side and often caught in the middle are families who have lived in the region for generations, most with ancestors who worked in the mines. Everyone shares a deep love for the land, but MTR (Mountain Top Removal mining which has leveled over 500 Appalachian mountains) is tearing them apart. We need to understand the meaning behind promises of “cheap energy” and “clean coal.” Are they achievable? At what cost? Are there alternatives to our energy future? 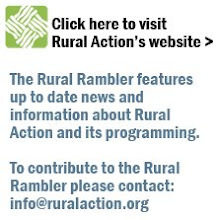 For more details on the free screening this Friday visit the Rural Action events site here. Come out to see this important film and join a conversation that will determine the future of Appalachia. We hope to see you there.